In Egypt, many political movements have started, or have grown significantly, on Facebook, such as the April 6 youth movement and now the national campaign to support Mohamed ElBaradei, former chief of the International Atomic Energy Agency (IAEA) and Nobel Peace Prize winner, for the presidency of Egypt. Facebook activism has done a lot for Egyptian dissidents and continues to worry the Egyptian regime. A group on Facebook supporting Mohamed ElBaradei managed to attract more than 130,000 members, and its membership is increasing at a fast rate. Even though online activism can't achieve the change young Egyptians dream of on its own, it is an important first step for mobilization in a political environment that doesn't allow for other forms of political rallying. It is unlikely that desktop activism can translate into something tangible unless it is backed by other forms of action. Currently, there is little indication of this rally in the virtual world transferring to the real world. Not under this constitution. Therefore, lobbying for constitutional change seems like the right starting point. Article 76 of the Egyptian constitution makes it technically possible but practically impossible for independent candidates to run for the top seat. It says that independent presidential candidates need the endorsement of at least 250 elected members of the parliament and municipal councils, of which at least 90 come from both branches of the parliament. These undue requirements are all the more burdensome considering that the vast majority of Egypt's parliament is made up of ruling National Democratic Party (NDP) members. This is why Mr. ElBaradei stresses the importance of constitutional reform. The former IAEA chief has been offered a position in many political parties that would enable him to become a party nominee. However, ElBaradei made it clear many times that he insists on running as an independent because his will to reform and amend the constitution outweighs his will to become president. The question here is if ElBaradei, along with his supporters, would be able to exert enough pressure to amend the constitution so it would allow for independents to run for president in 2011. Unless the pressure is immense, the answer would most likely be no. The reason is that constitutional amendments that have taken place in recent years were carefully tailored to make the next elections confined to the NDP candidate (probably Gamal Mubarak) and a few political figureheads from Egyptian parties who were closely monitored and given permission to operate by the Egyptian government. It will be a great show: five or six candidates from the handful of small, unpopular and poor parties against Gamal Mubarak, with all the media, financial resources and state apparatuses on the latter's side to help him win in every legitimate and illegitimate way possible. With the deck stacked so greatly in his favor, a victory for the NDP candidate is highly likely. This does not mean that his supporters should stop working on expressing their will to reform Egypt's political infrastructure and present ElBaradei as their candidate and symbol of change, but patience will be necessary. 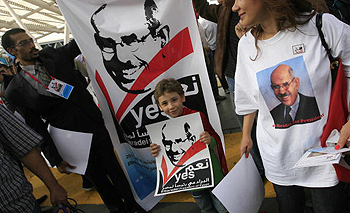 ElBaradei supporters should expect that he will not be able to run in the coming presidential elections in 2011, but if support for ElBaradei's continues to grow, the momentum may be a force in the longer run. ElBaradei and his supporters emphasize the importance that change and the transition of power happen peacefully and smoothly, which means the process might take longer, but that it will also be more sustainable. Abdelrahman El-Taliawy, an ElBaradei enthusiast says, "We are a very fortunate generation. We grew up to find ourselves connected, open to the world and, in a way, uncontrollable. We can feel ourselves holding the future with strings in our hands. But we are tied to our mystic past and grim present. If we are planning to do great things, then we will have to begin with revolutionizing our own country." El-Taliway goes on, "For us, ElBaradei represents that hope. Hope that we can really change the terrible conditions that we grew up to find ourselves part of. We're prepared to work with him on campaigns, talk to the people in the streets and publicly protest if we must. Now, we are united and we can feel the power of what we can do. They can never take that from us again."